Nicole's Needlework: Stash, smiles, and more! I think Mary Kathryn from Happy Stitcher is so talented! She also owns Handcrafts Online and sells finishing kits for the Crescent Colours/Little House Needlework collaboration kits. 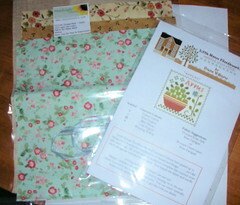 I love the fabrics she has chosen, so I ordered the fabrics for Watermelon and Pear, and ordered Apples along with the finishing kit. It came so fast! I was so excited to receive it all in the mail today! Apples Fabric, Threads, Linen, and Ribbon. 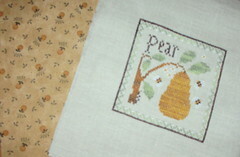 Pear fabric with my finished Pear. The smiles part of this post is Matthew smiled at me the other day! I couldn't believe it! At first I thought I imagined it, but then he did it again yesterday and today! I'll have to get a picture of it soon! Well, baby is crying, so I'd better go! Write more later... maybe I'll get to stitch on Watermelon, and have a progress pic to share! Congrats on your new job! 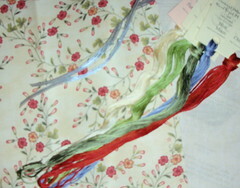 You're right, the fabrics are beautiful with the stitched pieces - good move getting those! I've been following your blog. What a precious baby boy!! Imagine how flattered I was to be mentioned in your post! Thanks for your support, enjoy the fabric, and the new home with your beautiful family.